Studio One of Alexandria, Inc.
Agnes comes to Studio One from the village of Rielasingen, on the Swiss border in southern Germany. She began dancing at 14, training under German champion Ewald Voegtler, and spent several years as the leader of a touring professional folk dance group in addition to her ballroom dancing. Agnes came to the United States in 1983, was hired as an instructor at Studio One in 1984, and has been with the school ever since, except for a three-year period spent back in Germany between 1987-1990. Agnes stresses good dance posture, and teaching the gentlemen to lead effectively. She takes pride in ensuring that her students don’t just know the steps, but how to dance them well and lead them properly. Agnes is another reason why Studio One is the best school in the area! Our dance standard is high, and our dancers are known throughout the local area and nationwide for the quality of their dancing. We offer instruction at every level from introductory social dancing to the very demanding competitive and show level. We work with you to plan a program that meets your needs and desires. Mr. Richard "Ben" Benjamin received his Bachelor’s degree in Speech and Drama from The Catholic University of America, thinking that he would become a drama teacher. He began teaching in 1976 in Bethesda, Maryland, and relocated to Atlanta, Georgia in 1978 to teach with the Fred Astaire Dance Studios, where he became the first teacher in the city to certify on the Professional Gold level. He moved back to Virginia in 1981, came to Studio One in 1985, and became the owner in 1988. Mr. Benjamin was a finalist in both the Rising Star and Open Professional Division at the Ohio Star Ball, and semi-finalist in the Rising Star Division of the USBC (now known as the US Dance Sport Championship). He won the Virginia National and International Championship (now known as the Virginia State Championship-East Coast Championship) in 1977 in the Professional Rising Star Division. 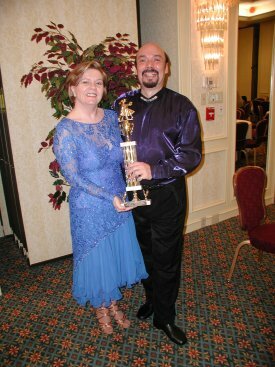 He is certified as a judge and scrutineer with the US Independent Ballroom Dance Council.